The Rachel Marie was docked at Pier 9 in August. Nearly four months after the launch of the city's ferry system, Ewa Beach resident Gloria Sylva-Crawford finds herself riding TheBus more often than TheBoat. "I enjoy riding TheBoat," Sylva-Crawford said, "but it gets very frustrating because you'd like to think the boat is reliable." The city marketed its commuter ferry system for its reliability, but cancellations for the Rachel Marie, one of the two catamarans, from engine problems have become so frequent that some riders say they no longer depend on the service. The city has canceled rides on the Rachel Marie this week as crews continue repairs on its port-side engine for the third consecutive week. "The Rachel Marie has been very unreliable, and we're extremely unhappy about that," said acting city Transportation Director Wayne Yoshioka. "We're certainly committed to getting this boat back up. We're looking at several different options on how to operate to show more reliability, because if we can't show reliability, it's not a viable mode (of transportation)." Yoshioka said the city is continually looking for a replacement boat within its budget. The Melissa Ann, which has a newer engine, has been running as scheduled. The Rachel Marie was also down for three weeks in November for repairs that required engineers to replace the port-side engine. It is unclear whether the breakdowns of the Rachel Marie have affected ridership, since city officials refused to release detailed numbers, saying the combination of the holiday season and rainy weather conditions alter normal ridership numbers. There were 1,936 riders in December, bringing the total ridership since the Sept. 17 launch to nearly 16,000, according to city spokesman Bill Brennan. The catamarans that connect Kalaeloa to Aloha Tower can hold up to 149 passengers each and provide six round-trip rides a day. 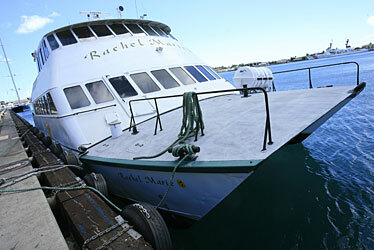 The Rachel Marie, which was built in 1988, provides the 6 a.m. run from Kalaeloa to Aloha Tower and the 5:20 p.m. ride in the opposite direction. When these rides are canceled, the city provides shuttle buses in their place. However, these shuttle buses going across the island are nearly empty. "People have kind of given up on the second boat (the Rachel Marie)," said Daws Dymond, who drives the shuttle bus connecting Waikiki to Aloha Tower. "One day we had only four people on the bus. It's a waste of money for everyone, especially the bus company." The city budgeted $1 million to create routes and shuttle buses that connect TheBoat riders to Kalaeloa Pier and Aloha Tower. "Because it's a lifeline for the people originally riding TheBoat, we have to provide the backup, whether it's heavily used or not," Yoshioka said. TheBoat is a yearlong pilot project, funded by $5 million from a federal grant, and some City Council members said receiving future funding for a permanent service could be challenging with the ongoing problems. TheBoat's operators, Hornblower Marine Services, are responsible for repair costs. "It's hard to build on success when you're not running at full capacity," said Councilman Nestor Garcia, also chairman of the Council's Transportation Committee. "It will be difficult to continue with this on-and-off-again service. I'm hopeful that they will get everything in full operation so we can have an accurate picture if this demonstration project should go forward."